Undoubtedly stylish. Proclaimed by many as the best ever. Admired by millions over the last few years. 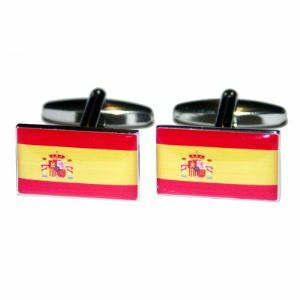 No, we're not talking about these Spain Flag Novelty Cufflinks, we are referring to the Spanish team, who are hot favourites to win Euro 2012. To be honest, there are even better England related ties and cufflinks available at Ties Planet. But surely they can't win it. Or can they?! !